GLENDALE, Ariz. — Martin Erat has something the Phoenix Coyotes have wanted for a long while. The Coyotes have something Erat has wanted all season. In the end, that mutual attraction led to Tuesday’s deal — imperfect as it looks to some outsiders. The Coyotes finally got the playmaking wing they sought all season to team with Czechs Martin Hanzal and Radim Vrbata when they dealt defenseman Rusty Klesla, prospect Chris Brown and a 2015 fourth-round draft pick to the Capitals for Erat and minor league forward John Mitchell, who will report to the Coyotes’ AHL affiliate in Portland, Maine. Phoenix also sent defenseman David Rundblad and minor leaguer Mathieu Brisebois to the Blackhawks in exchange for a 2014 second-round pick in a separate deal. "We’ve been looking at Martin for a long, long time," Coyotes general manager Don Maloney said. "He’s not a dynamic, high-end pure skill player, but he fits into who we are." Or at least who the Coyotes want to be again. "There’s players that make good plays in hard situations and he’s a guy that has the ability to do that," coach Dave Tippett said. Erat has struggled to find his scoring touch this season. 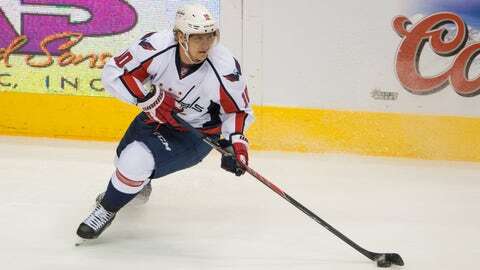 He has just one goal to go along with 23 assists and has clearly been unhappy with his role in Washington, where he was relegated to the fourth line early this season under coach Adam Oates. "I’ve been used to playing in a different system and I think Phoenix is very close to what I played in Nashville," Erat said via conference call. "It’s all about how the coaching staff trusts you." Erat was an effective two-way player for eight seasons with the Predators before he fell out of favor with coach Barry Trotz — much of it his own doing. He never totaled less than 49 points in those eight seasons and he topped out at 58 in 2010-11 when the Predators posted the first playoff series win in franchise history. But with his role reduced, Erat became disenchanted and requested a trade — a demand he made again with Washington this season. The requests earned him criticism and the label of a malcontent, particularly in Nashville. In his final season with the Predators, Erat was also criticized for a lack of effort, which didn’t sit well withTrotz’s blue-collar approach. But Erat has always gotten along with teammates and GM Don Maloney believes the change of scenery will do him some good, especially playing alongside his World Championship Czech teammates and center Mike Ribeiro, who was in Washington last season. "It just didn’t work for him there," Maloney said. "We’ve seen it ourselves. Some people fit in some organizations; they just don’t fit elsewhere." "He has a great pedigree. He’s tied with our goaltender for goal scoring so it hasn’t been as good as we need it to be, but we think that can come back." Maloney believes Erat will help the Coyotes’ 27th-ranked penalty killing unit and he could see some power play time. But unless the Coyotes make another move before Wednesday’s 1 p.m. trade deadline, Erat’s pass-first-shoot-later mentality will find a warm welcome on the playmaking-starved Hanzal-Vrbata line. "We think with our Czech players and our Czech synergy that we have good luck with Czech players," Maloney said. Although he has played on the left side this season, Erat has played the majority of his career on right wing where he admitted he’s more comfortable, and where Vrbata currently plays. "I don’t mind moving over to the left side if that’s the way to make it work," Vrbata said Monday when the hypothetical addition of Erat was floated. "He’s more of a playmaker, a guy who normally gets a lot of assists so I think it could be a good fit." Erat is under contract next year for just $2.25 million despite carrying a $4.5 million cap hit. His presence could help lure back Vrbata, an unrestricted free agent, although Vrbata reiterated Tuesday that he wants to remain in Phoenix. Despite Erat’s addition, Maloney did not close the door on further deals, noting that he’d still like to add a forward and maybe a defenseman. Edmonton’s Ales Hemsky is still avalable and that second-round pick the Coyotes acquired in the Rundblad deal was said to be the asking price for the Oilers’ skilled Czech forward. If another player is added, that could mean a different role for Erat — who is also comfortable playing with Ribeiro. "There were some question over the last day or two based on recent play: are we sellers? Are we going to get rid of people?" Maloney said. "Well, we still believe in this group and we’d like to add to this group." As for Rundblad, Maloney admitted his style made it difficult to find him ice time. It was no secret the coaching staff didn’t feel comfortable with Rundblad’s defensive play and his inability to play on the penalty killing unit further hampered the club, with Keith Yandle also out of that mix. "With the emergence of (prospects) Connor Murphy and Brandon Gormley, we just thought that second-round asset is an asset that we can use," Maloney said. "We’re still looking to use that if we can help ourselves."